The forecast called for an unusually warm and completely sunny weekend (and that in November!) so we decided to head out for what is likely to be the last climbing of the season. We were ready to stay in the winter room of a hut, but since the weather was going to be good, the folks running the Grubenberghütte decided to open it for the weekend. Bonus! We left early on Saturday and took the train to Schönried, from there the gondola brought us up to the Rellerigrat (looks much different now than last time we were here). Some lovely walking (with great views!) 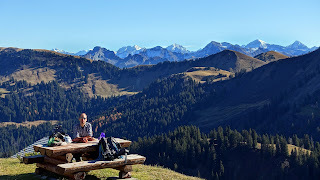 later we hit the Grubenberghütte where we enjoy a sandwich out in the sun, learn that they weren't expecting the hut to be full (only 13 reservations! ), drop off stuff we didn't need while climbing, and figure out what we are going to do for the afternoon. 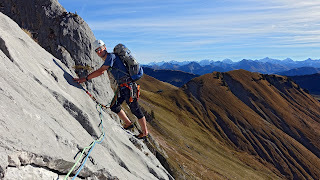 The weather is great, but the days are still short, so we can't do anything too ambitious, we decide to head off to the Wandflue to do a shortish multi-pitch route. Greg is initially worried that it's going to be completely packed (beautiful weather, parking lot 10 minutes walk from the wall, great climbing, etc. ), but it ends up not being too bad: there are about 4 other groups there. After surveying the situation, we decide to do the route 5eme Symphonie (5b, 5c, 5b, 5b). The rock is lovely limestone, with Wasserrillen (like on the Mattstock), and it makes for lovely climbing. Greg leads the first pitch, Andrea does the second, which has an adventurous traverse section before needing to get over an overhang, and then Greg leads the third. The third is long and very sparsely bolted (4 or 5 bolts over a 50m route); fortunately the rock is great and the climbing isn't overly difficult. From the stand we can't see the first bolt of the fourth pitch and we're both a bit nervous after that third pitch, so we opt to just abseil down from here. This goes pretty quickly and we're at the bottom of the wall before we know it. After another short sandwich break we head back to the hut, enjoy a cool beverage and the views in the last of the sun, and settle in for the evening. There are really only 13 guests there (nine of them are one group), so we enjoy fondue in a half empty hut and are only sharing our sleeping room with two others. What luxury! After dinner it remains very clear and isn't too cold, so we go out and watch the stars for a while. Amazing weather for November. 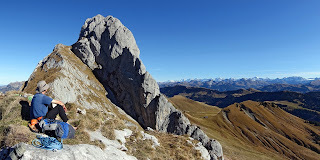 The plan on Sunday is to get to the bottom of the routes on the Dent de Ruth earlyish and climb the Diehlkante. We are underway before 8:00, but still get to the routes behind two other climbers and just ahead of another couple (they all slept in their cars/vans at the parking lot below the hut). Given that the first two are doing the Diehlkante, we opt to move to the left to L'avenue des Chamois. This is a lot easier, but we're ok with that. The two behind us arrive a couple minutes after we get there; they're doing the same route. The route is long, but pretty easy (3c, 4c, 5a, 4c, 4c, 4b, 4c, 4c, 4c, 2c), the rock is great, and the weather and views are once again amazing. We end up letting the other couple pass after a few pitches; despite their protests, they are definitely faster than us and we are taking more breaks than usual along the way to enjoy the views. Once up top on the ridge we do a lunch break (oh! the views!) and change shoes. From here we can either follow the ridge and do some scrambling to the top of the peak or abseil down. Since we don't have a great description of the difficulty of the route to the peak and we do need to keep an eye on the time, we opt to abseil down. This ends up not being the best choice because at some point we lose the abseil piste and end up on the route, hitting a stand simultaneously with a group of three English speakers. After they head on, we do a bit of improvisation to follow the route down. This works, but we end up spending lots of time fighting with tangles in the rope. By the time we make it to the bottom, we're both definitely ready to be done. After another sandwich break we pack away the gear and, now very conscious of the time, head back. We're going to be too late to catch the last gondola down from Rellerigrat (at 16:30), so below the hut we decide to head to Saanen. Unfortunately the trail here follows the road, so from Lauchnere on we're on the road. Luckily it's not too busy and the going is quick. Outside Unterbort a farmer picks us up and takes us the last bit down to Saanen (nice!). We've got an hour until our train and there's not much around the station, so we grab the bus (just getting there!) to Schönried. Here we have a quick, but nice, dinner in the hotel restaurant near the station and then board the train for the long, surprisingly crowded, way back to Basel.